This page was designed to help parents, scout leaders and teachers find information about crafts and were to order often hard to find supplies. As a former teacher trainer and member of many education committees, I just can't resist listing sites I find on the net that look helpful to teachers. First I had to divide the resource and supply pages into Jewith and Non Jewish. Now the pages have got so long I have divide the Jewish pages into two Jewish resources and Jewish Supply Sources. I suggest that Jewish teachers look carefully through all of these pages as many of the basic skills and lessons listed are invaluable and can be applied to any setting. Offers candles and candlemaking supplies. I just realized I needed to list them on the Jewish Pages. They have beeswax and parafin sheets. (great for rolling Chanukah and Havdallah Candles.) I recently visited their site again and found parafin sheets. They say they are cheaper than beeswax and softer for children to use. They have some great metal molds including 6 sided star pillar and shabbat candles. Plus oil for Channukah mennorahs or Shabbat but they seem to carry many accessories. Watch for more candles projects as I bought some of their paints. Jewishcrafts.com - Just for the Mitzvah Catalog. Jewish Craft Supplies. Just redid their site. Now has a new on line catalog. Lots of great Jewish crafts including lots of wooden projects. Most are in the $1.00-$2.50 each in dozen lots. (slightly higher for individual sets.) Since many projects look like they would take longer than the 30 to 40 minutes in a typical class, (while you wait for paint and glue to dry etc.) it looks like they would fit my 2 day budget. I especially liked the many mennorah and seder plate kits. Hats to color for all occasions, holidays, camps, birthday parties etc. Great pictures and very reasonably priced. Perfect for classes, camps, libraries, zoos and more that need a creative project. Pictures printed on the hats are great and real fun looking. Plus large area left for child to individualized and add his or her own creative designs. She has a great section for Jewish Holiday Hats! Holidays, Shabbat, Israel, Aleph Bet, Birthday, Tzedakah, Brachot and Israeli Flag. Pictures are really appropriate for the occasion, lots of Hebrew too. A old favorite catalog of mine. She just starting to put some of her craft products on a seperate site. Now mostly great fabrics. You can order free catalog for crafts, minatures, charms, jewelry,fabric,rubber stamps, ceramic kits, and gifts. Has many things for home decorating, jewelry making and simchas. Includes some great sponge painting kits. Has great FABRIC for make your one tallits. Catalog now features ready made (for people like me that are crafty but can't sew) aprons, place mats, clothes made of Jewish FABRIC. Also great fabric for the new fabric bowl craze! See Lori's Crafts at Chadis Crafts and Kippot for ideas on Judaic fabric bowls. For those of us that can't sew, I have already bought many of her products and they are incredible! Lori is a visiting artist at chadiscrafts.com. Also see Eileen's new links to fabric bowl info on Eileen's needlecrafts page. This site has lists of Jewish Needlework,Crafts and Supplies Sources and Catalogs. A huge store in Boston. Offers some on line items. The store offers everything Jewish so if you don't see it on line. Use there 800 number or email them. Hebrew wooden Aleph Bet beads. Sells some craft kits and stickers. Plus many toys, games, puzzles, gifts etc. Jewish and Hebrew Learning and Teaching Aids, Music, Software and Books. This a great company whose catalog I have had for years. Just found their web site. Tell them I sent you please. Favors, candies, items with logos etc. Imprinting. Has some Jewish things. They carry things for Bar/Bat Mitzvahs and weddings too. Jewish candy and chocolate molds. Some hard to find Jewish molds for making candy. If you buy extra you can use them for plaster, soap etc. Love the extra large seder plate mold, Purim molds and more! They sell supplies for soap and candies but you will have to check with them but they say many are Kosher. They just got in parave baking chocolate in white and dark. YUM! They have some great Chanukah molds and supplies, including sugar shapes to put on cakes or cup cakes in the shape of driedels and Menorrahs! Jewish educational and craft materials. Has some really unusual items with some real basic supplies that are a must for Hebrew teachers, Day schools and Jewish Preschools plus just for us crafters and parents. Sells Jewish Educational Materials. Sells Aleph Bet and Holiday cut outs, room posters, flash cards etc. Also has a few activities. I can't believe I did not find this site before! Wood kits sold in bulk. Purim, Chunukah, Shabbat and more. Groggers, dreidels, yads. All look to be in quality wood products perfect for the classroom, for home schoolers and camps. Sold individually and in bulk discounts. Has educational toys and materials for the home and the classroom. Just got their Passover catalog. Wonderful class packs for seder plates. Really different materials for teaching about Passover. Perfect for preschools and elementary schools. Also offers flannel boards, games, stencils and more! Has thousands of products including Israeli made secular educational products. Resources and Links for Jewish Fabric crafts. Supply sources, pattern sites and more! A great resource page. Great site for craft supplies especially for preschools. Has some Jewish crafts too. Long time favorite of Eileen's. Long time craft supplier. Has design and play dreidel kits and 6' and 9" rugs with all of the holiday on it. Long time craft supplier. Has some Jewish Textile papers and sponge stamps. After many requests, finally found a company that speciallizes in Rubber stamps and has a huge number of Jewish Rubber Stamps! Some are pictured online but you can buy a catalog to see their full line. Great for making your own invitations! 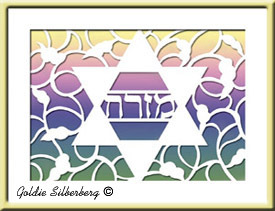 Another great source for rubber stamps including Jewish ones. Owners of Ruth's Jewish Rubber Stamps and MNC Rubber Stamp Studio. Has their own line of embellishments for fabric crafts and more. Rhinestones and more that you can glue with the hot fix method. They sell the tools too. All of their sites has great free projects lessons! Great source for Jewish paper for scrapbooking and more! Has some craft lessons too. Cutting tools and other products for scrapbooking, rubber stamping, quilting and more. Includes die cuts for most religions. See above for full descriptions but they are also a great source for Judaic fabric. California Stitchery's own web site. They have been around for years and have wonderful kits for crocheting, needlepoint etc. Kits for mezzuzah cases, kippot, challah covers, tallit bags etc. 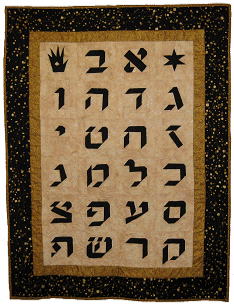 Jewish Quilting DesignsPatterns for sale for sewing a Kippah, challah cover and more. Stain Glass patterns for sale. Has some Jewish ones too. Reasonably prices patterns. Might be able to be used for other crafts. Hand Painted Needlepoint canvases for sale. Some Jewish ones too. Kits for Jewish needlepoint, cross-stitch and ceramic bisque. Shabbat Lights offers incredible GLASS CANDLES that use liquid parafin. They come in two beautiful shapes and fit most conventional candlesticks. They can be adjusted to burn between 2 and 6 hours. They would make a wonderful wedding, bar/bat mitzvah gift or just something special for yourself! We love ours! The are now offering a set of 8 traditional candle shape glass candles and one pear shape with liquid parafin to use for Chanukah. Check this out. clay, beads, wood, plaster, gymp, copper rubbing, and more! large rolls of wide and pattern gymp, gymp books and supplies. You will have to email or call to get their small Judaica Craft catalog. Judaic, Jewish, Chanukah, Shalom etc. Great Judaic Symbol beads, aleph bet beads and more. Check out these S & S products. Some are sold as group kits. You will have to search on words: Jewish, Judaic, Chanukah, Shalom, Aleph and more. Great for clip art for all of your scrapbooking, crafts and newsletters. Learn Hebrew and more! Jewish Crafts discussion group. A perfect place to "meet" other Jewish Crafters. Great place to ask questions and get ideas. Has achived links to Jewish Crafts, suppliers, professional craft events, needlework info and much more! pewter, golden pewter, enameled, ceramic and resin styles! Judiac pattern fabric creations. Including fabric bowls, and boxes, insulated lunch boxes, tote bags, challah covers, recipe boxes, matzah trays, Wedding wine glass bags and more coming.